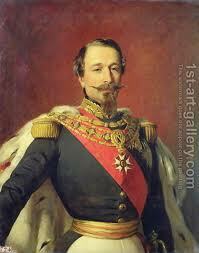 Napoleon III, nephew of Napoleon Bonaparte, grew up in exile, determined to regain the throne of France. After the 1848 Revolution, he was elected President of the Second Republic (1850-1852), then he was made Emperor (1852-1870). While his domestic policy was fairly liberal and forward thinking, a distrous war with Prussia led to his downfall. He was deposed and sent to England where he died in 1873. This page is currently under construction and will be completed very soon. Thank you.